What kind of work can the idea of personhood do in political theory? To answer this question, Molefe, engages with Ikuenobe’s novel approach to the idea of dignity; Ikuenobe defends a communal conception of dignity that grounds it on the normative idea of personhood. Ikuenobe’s aims in doing so are two-fold: Firstly, he seeks to situate the idea of dignity on a more plausible moral ground. He does this by repudiating alternatives that ground dignity solely on some ontological capacity considered outside of the use it is put to—the individualistic approaches. Secondly, Ikuenobe aims to demonstrate that situating the concept of dignity on the grounds of personhood can do valuable political work. 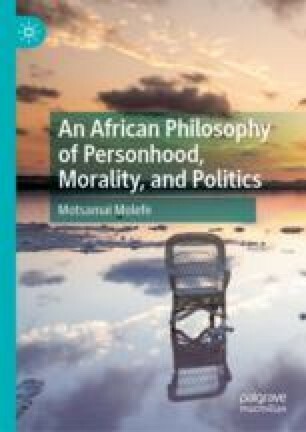 However, Molefe argues that dignity cannot be grounded on personhood, for two reasons: (1) The idea of personhood is patently inegalitarian and the idea it seeks to explain—dignity—is egalitarian, at least under modern interpretations of the concept; dignity equalises moral patients and personhood does the opposite. (2) Furthermore, basing dignity on personhood threatens vulnerable groups exemplified by the young and marginal cases, and this should make us hesitant to accept such an approach. I am truly grateful to Johnbosco Nwogbo for insights we exchanged in the development of this chapter. This chapter is in a much better shape because of his incisive analysis and fruitful contribution. I, however, take all the responsibility for the limitations of this chapter. Jollimore, T. (2014). Impartiality. In E. N. Zalta (Ed. ), The Stanford Encyclopedia of Philosophy. Retrieved from http://plato.stanford.edu/archives/sum2011/entries/impartiality/. Wingo, A. (2006). Akan Philosophy of the Person. In E. N. Zalta (Ed. ),The Stanford Encyclopedia of Philosophy. Retrieved from https://plato.stanford.edu/archives/sum2017/entries/akan-person/.